Even after 23 years of working with these seabirds, I never get tired of watching them and always welcome the visitor that occasionally lands on my head. On Day 6, a small crew heads out at 6 a.m. for a final, and unfortunately unsuccessful, attempt at filming tiger sharks feeding on black-footed albatrosses at the water's edge. On Tern Island later in the day, the film crew has the opportunity to film a plane landing and the remarkable effort the island's staff and volunteers undergo to clear the runway of the thousands of birds before the plane lands. On Day 7, the sea team finds a beautiful spot for filming jacks and other fish while the land team gets a firsthand tour of seabird surveys on Tern Island from Beth and other biologists. Watching a great frigate bird eat a sooty tern chick while I was with the film team reminded me of a line from the Sharks at Risk film JMC shared with us last night. To paraphrase the quote in relation to what we have just witnessed here on Tern Island: "For this chick, her fate will not be as a mother, but as a meal, in an exchange of one life for another." 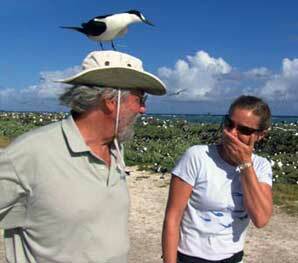 Jean-Michel Cousteau and Tove Peterson remark on the many birds on Tern Island, as a Sooty Tern observes from atop Jean-Michel's head. We have had a good year for most seabirds, with most of the Laysan and black-footed albatrosses managing to fledge and leave the colony successfully. The sooty terns also had a good year. I especially enjoy this species, as it is always fun for me to see so many in the colony. Even after 23 years of working with these seabirds, I never get tired of watching them and always welcome the visitor that occasionally lands on my head. No matter how strictly we protect the seabirds here in their breeding colonies, we cannot insulate them from human effects far out at sea, such as fisheries interaction, entrapments and marine debris. This morning I had a chance to share with the film team our Bulwer's petrel's nest boxes. We tried to creatively figure out the best way for many people to experience the intimate moment of looking into a burrow and hearing their musical call by using high-tech camera and audio equipment. Now that I am staying ashore for a few days while we are anchored here at Tern Island, I miss the good companionship on the Searcher. But I know that we still have three weeks together to share our experiences both ashore and underwater. We thoroughly enjoyed Jean-Michel's newest film, Sharks at Risk, which he kindly shared with the Tern Island staff. In my once-a-year visit, I also enjoy catching up on the decades of hand-me-down books found in our lounge. Enjoying convivial meals and watching our resident gecko lick and eat a brownie crumb on the table. How easily amused a table full of biologists can be.